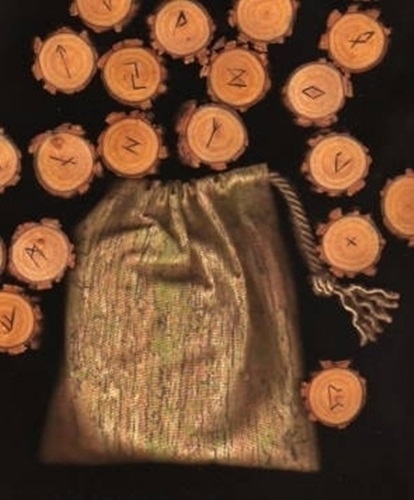 Runes & Bags - Tree Bark Rune Bag - Tarot Bags, Tarot Cards, Cloths, & More! The textural fabric of this runes pouch depicts the colors and lines of actual tree bark. We think it is a superb match for a wooden rune sets. This unique pouch is shown in the picture beside a rune set made from a single WILLOW branch. Only the bag/pouch is available from this online store. Size: Short, slightly less than 5 inches wide by 6 inches high. Color scheme: Primarily tan with lines of dark brown and patches of lichen green.